Voucher codes and promotional codes to use on airport parking bookings and meet and greet at aceairportparking.co.uk. Book low cost Meet and Greet Parking at major airports throughout the UK. Ace Parking serve passengers travelling to and from arts such as Gatwick, Heathrow, Stansted, Birmingham up to as far as Edinburgh with the Park Mark safer parking award being one of many accreditations. Regular users can take advantage of the Ace loyalty program offering discounts of up to 20% off bookings. Your flights are booked for your holiday and now it’s time to figure out a way to get to the airport. What about Meet and Greet parking? Ace Airport Parking started from humble beginnings, but is now available at all the major airports in the UK. Before you choose a provider, you’ll want quotes. 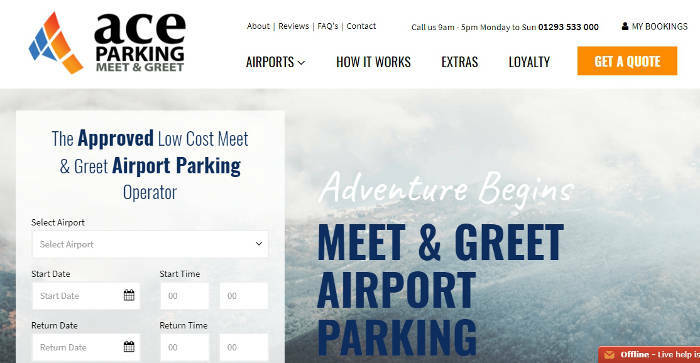 Ace Airport Parking makes it extremely easy to get one without any obligation to sign up. You can put in your dates of departure and arrival and make sure someone is ready for you. This is also where you can use a voucher code to make sure you get the best prices. To help you save money, Ace Airport Parking also offers the chance to sign up to the newsletter. You’ll get offers through to your email regularly. There is also a loyalty program that you can sign up to, offering more discounts in the future. Everything Ace Airport Parking offers is clearly noted on the website. All your questions will be answered through easy and quick browsing. But if you still want to get in touch with someone, that’s possible. The footer of the site has the local area phone number (including in your mobile minutes plan) to call the company directly. Underneath the number are two email addresses and a physical address. There’s always an option depending on your needs. They’re also on Twitter to make it easier to get in touch on the go! Plus, there’s a Contact page that clearly breaks down the way to contact depending on your exact needs to make it all easy. The only real downside to the site is the newsletter option pops up on every page. It can get annoying if you’re trying to find out more about the firm when that gets in the way.